Founded in the year 2011, at Morvi (Gujarat, India), we, “Nilkanth Glazed Pvt. 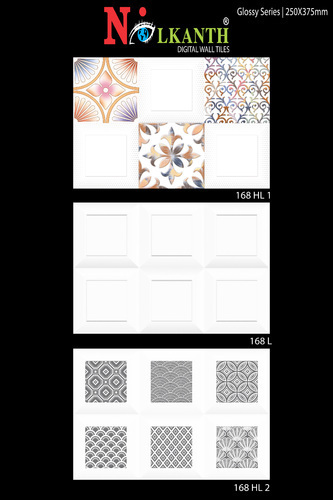 Ltd.”, are successfully ranked amongst the top manufacturer, exporter and supplier of a comprehensive assortment of Luster White Tiles, Luster Ivory Tiles, Ordinary White Tiles, Ordinary Ivory Tiles, Luster White Highlighter Tiles, Black Series Tiles, Brown Series Tiles, Blue Series Tiles, Elevation Series Tiles, etc. These are manufactured at our sophisticated manufacturing unit using supreme grade factor inputs and sophisticated technology. Also, the offered products are designed with high precision in order to meet the international quality standards. The offered products are highly appreciated among our esteemed clients due to their reliability, sturdy construction, easy installation, low maintenance, attractive design and longer life. Apart from this, the offered products are available in various specifications and dimensions as per the varied requirements of clients. Moreover, clients can avail the offered products from us at the most affordable price range. We are offering our products range under the brand name of "Remona Wall Tiles".